Directly across the road from Signpost 29 (center of photo) are the remaining eucalyptus slated for removal on UC land in Claremont Canyon. UC is currently negotiating with FEMA to get funds returned so their wildfire safety program can move forward. 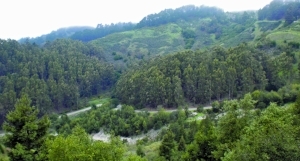 Trees seen along the ridgeline (top of photo) are on EBMUD property. These are being thinned over time as an alternative to complete removal.